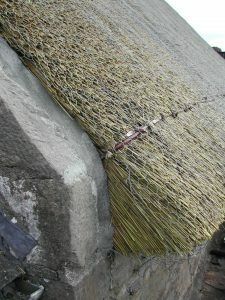 Thatch is the traditional roofing material of Ireland and was almost universal in modest houses until the mid nineteenth century. Locally available split stone or slate was used but it was not until the widespread availability of cheap Welsh slate that the major changes occurred. Slate required little maintenance, was easily worked, attractive, and remained the main roofing material until very recent times. Widespread use of clay and concrete tiles has surpassed the use of slate but it remains the best material for repairs and extensions to old buildings. Thatch has declined alarmingly – there are now fewer than 150 inhabited thatched buildings in Northern Ireland. Concern is so great for their survival outside museums that NIEA are offering 75% grants towards thatching and maintenance. Old problems of damp and mould are easily solved today and while regular maintenance is required the benefits of beauty and character plus the grant available can swing the financial balance. There has been a great revival of interest in thatching in Britain and this is spreading to Northern Ireland. Thatchers are now more easily found and there is no doubt that the craft will develop with the revival of interest in thatching. Natural slate is also enjoying a revival and with the high cost of new slate, a market led demand for salvaged slate has emerged. When re-roofing is necessary careful choice is required to avoid a patchwork quilt of blues and greys as there are considerable differences in colour. It is wise to avoid mixing slates from different sources so the original ones should be kept together and used on the most prominent elevations. Delaminated slates or ones with splits or overlarge nail holes should be discarded. Variations in detail in the roofscape such as rows of particularly large slates at the eaves, called queens, diminishing courses, that is slates getting gradually smaller towards the ridge, and the ridge materials (stone, clay or lead) are of immense importance to the character of the building and should be retained. It is vital to check roofs regularly for slipped or missing slates and to repair promptly. Westmoreland or Norwegian green slates were popular in Ireland in the inter-war years and it is still possible to get new slates to match. Clay tiles are a very old roofing material rarely found in Northern Ireland until modern times when the ‘Rosemary’ small plain tile became popular. Cedar shingles enjoyed a brief boom in the 1950s but in general have not fared well in the damp climate. 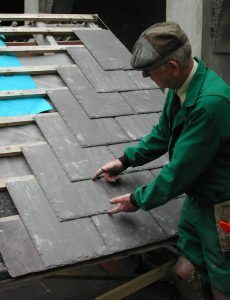 In general natural slate roofs should have a minimum of 35° pitch, rising to 45° or greater for small slates. Where the roofs are at too low a pitch to lay natural slate, a different material such as lead should be used. Finally, painted corrugated metal sheeting is a traditional roof in the country, mainly over barns and out-buildings, but often over the top of thatch on houses. Black, green or ‘red lead’ are the common colours and their use should be considered on all rural building groups.